High angle view of a rugged terrain, Grand Canyon National Park, Arizona, USA. I have to admit that the first time I saw the Grand Canyon, I was slightly underwhelmed. For some reason, I thought that it would actually be deeper. But the next day I hiked from the South Rim to the Colorado River and back, and realized it was plenty deep enough. I was hooked. Since then, I’ve returned to Grand Canyon National Park many times, and most of those visits have been in winter. It’s my favourite place to get in some miles when Canada’s trails are covered in snow. Hiking in the canyon is just like hiking in the mountains—except in reverse. You start at the top—which in the winter means the 2,200-metre South Rim. (The North Rim of the canyon is closed to vehicles at this time of year.) From there, it’s about 1,500 metres down to the river at the bottom. And then, of course, it’s about 1,500 metres back up again. Most visitors to the park never set foot below the rim, and some of those who do get into serious trouble. That’s because—as the park’s many warning signs indicate—the temperatures in the summer are potentially lethal. Hiking in the Grand Canyon in winter is an entirely different matter. 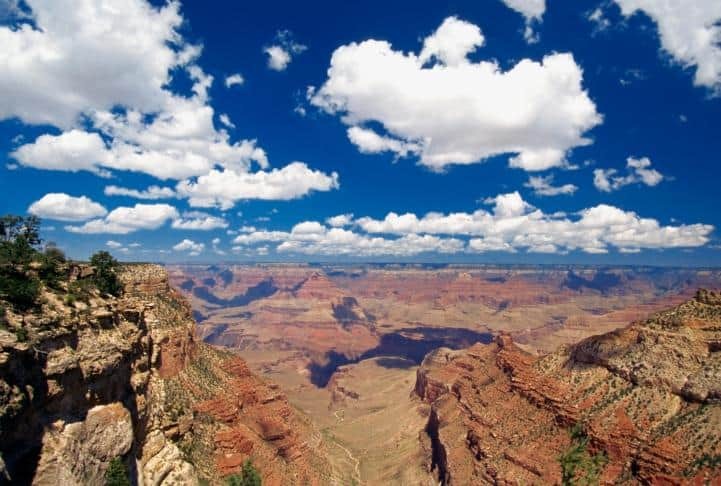 Even though the canyon is located in Arizona, its altitude means the temperature at the rim is chilly—there’s usually a bit of snow at the top. But once you start hiking, the snow disappears within about five minutes. By the time you’re a third of the way down, it feels like fall, and by the time you reach the bottom, you may even be tempted to go for a swim in the river. There are a number of hikes that head down to the bottom, but my favourite is the South Kaibab. Unlike the more popular Bright Angel Trail, the South Kaibab follows a ridgeline for much of its 10-kilometre length, delivering panoramic views almost from the start. You also get several sneak peeks of the river along the way. Once at the bottom, you can turn around and head straight back up (if you’re a strong hiker in a hurry). But on most of my visits, I head for Phantom Ranch, the only lodging at the bottom of the canyon. Then, after a day or two exploring the canyon—and enjoying the comforts of a bed and shower—I head back up on the Bright Angel Trail, which may have more people, but also has a place to get drinking water. One year, I decided to try something a little more ambitious—a rim-to-rim-to-rim hike. The plan was to hike down the South Kaibab to the river, then up the North Kaibab Trail to the North Rim, then back to the river, and finally up to the South Rim again on the Bright Angel Trail. All in all, it would be about 72 kilometres, with a total elevation gain of more than 3,100 metres. My goal was to do it in under 24 hours. I started at the South Kaibab trailhead just after midnight, and the first few hours in the total darkness were magical. I figured I was probably the only person actively enjoying one of the world’s seven natural wonders. I made good time down to the river and then across to the bottom of the North Rim, and was delighted to find drinking water there. (Park rangers hadn’t been sure if the tap was still working.) The hike up to the North Rim took a little longer than expected—it sits about 300 metres higher than the South Rim, and there was a fair amount of snow on the final few kilometres. But at least it was finally getting light. I reached the top at 8 a.m. The walk back to the river felt good, but when I started the hike up to the South Rim, I began to run out of energy. The last five kilometres took an agonizingly long time, but I eventually made it to the top. My time was about 16.5 hours. It was an interesting experience, and I’m glad I did it. But there’s definitely something to be said for stopping along the way to enjoy the view.